The Gretsch company was started By Friedrich Gretsch. He was trained in instrument building while employed by The Albert Houdlett & Son drum and banjo company of Brooklyn, NY. In in 1883, He left the Houdlett & Son company to form his own business, Fred Gretsch Mfg. Co. which is still in business today. Although best known for drums, and later Guitars, the Gretsch company also made Ukuleles and Banjos. Gretsch was also a musical wholesaler. Around the 1950's Low-priced and mid-priced instruments would be made by other manufacturers and then resold with a Gretsch logo on them. Gretsch also built instruments to be sold by other labels, and had a subsidiary line, Bacon, to round out the market range. I believe Gretsch stopped making ukuleles sometime in the late 1950's. 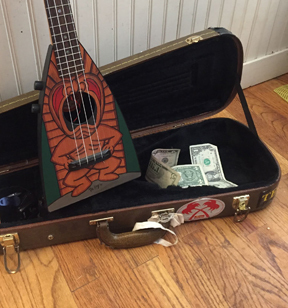 In 2012, Gretsch reintroduced a full line of ukuleles as part of their "Roots" line. I do not know where they are made, but the low price suggests overseas production.